What is our Openness Philosophy? Christine_Williams was diagnosed with idiopathic pulmonary fibrosis (IPF) in 2009, and ever since, she’s been managing a “rollercoaster ride that’s terrifying and not fun.” But she’s connected with your community on PatientsLikeMe for inspiration and was even referred to a new medical center to be evaluated for a lung transplant by her “rehabilitation buddies.” Below, read what Christine shared about her diagnosis, progression and thoughts on living with IPF. Can you share a bit about your diagnosis experience? We’ve heard from many members that finding an official diagnosis isn’t always easy. What that true for you, too? Mostly no. In March 2009, I contracted pneumonia back to back within 8 weeks. It was around the time when the swine flu became a big deal, and I had visited Cancun, Mexico that year. I wasn’t necessarily in great health but fairly healthy. I had always attributed my shortness of breath to me being overweight. Because of the pneumonia, a CT scan was ordered. Then a bronchoscopy and finally a video assisted lung biopsy. I was diagnosed however right after the bronchoscopy. I started exhibiting shortness of breath symptoms in 2001. Even went through a series of PFTs at the time but was given an inhaler and told to lose weight. Ironically I didn’t start to suffer from REAL shortness of breath until after the diagnosis. Perhaps I had an exacerbation when sick with pneumonia. How has your IPF progressed over the past five years? To tell you the truth, I really don’t know. I figured the doctor would tell me if there was an exacerbation or not. No news is good news? I do know that my disease had stabilized within 2 years because I was “kicked out” of the lung transplant program so to speak. I no longer needed to see the transplant team doctors however was recommended to still see my pulmonologist which I did. It was only the diagnosis of pulmonary hypertension (in October 2013) that the option of lung transplant is back on the table. I know I need to know this information and will ask my pulmonologist how my PF has progressed when I see her this month. I was only using oxygen at night until March 2013. Then I started using it full time. My liters per minute (LPM) has increased since then too (from 2-4 at rest and 4-6/10 on exertion). Take us through a typical day in your life – how are you managing your IPF? I officially retired from my job December 2014. I have up days and down days. Every morning I open my eyes, I thank God! I attend pulmonary rehabilitation (PR) twice a week (Tuesdays and Thursdays). I used to attend a yoga class given by the PR until it was cancelled. I hope they bring it back soon because it brings me much needed peace and helps me breath better. I try to be as “normal” as possible. I cook, clean, spend time with family and friends. I also help take care of my 5-year old twin grandsons for about 3 hours every day after school. I run errands; post office, dry cleaners, etc. Sometimes I go to the doctor by myself but most times I ask for someone to go with me; just to have another set of eyes and ears. I rely heavily on my support system both in person and on-line. Since it looks like a lung transplant might be back on the table for you, can you tell us a little about what the experience has been like? It is a very exhausting experience. I’m being evaluated by three different centers (University of Pittsburgh Medical Center, Temple University and New York Columbia Presbyterian). Every other week, I’m changing my mind. Traveling back and forth, making appointments, getting all the tests done can be extremely stressful. I was initially with the University of Pennsylvania lung transplant center. I was rejected by them because of esophageal issues. I was so defeated that I went home and cried and said I can’t do this anymore. But I guess God has something else in store for me. I was referred to UPMC and my cousin had a double lung transplant at Temple. One of my “rehabilitation buddies” went to NYCP and referred them to me. I am a part of the NYCP program and UPMC and Temple are in the process of testing me. 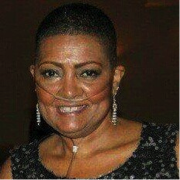 I know that lung transplant is not a cure but an option. It’s trading one set of challenges for another. It is good to see some people that I have met on-line over the years thrive with transplant. How have others in the IPF community on PatientsLikeMe helped support your journey? Words cannot express how I feel about the IPF community! As I mentioned earlier, they are an important part of my inspiration. Their honesty, love, courage and encouragement help keep me going when I think I can’t go on anymore. I pray for our individual and collective healing on a daily basis. You post a bunch to the “Today’s Thought” thread in the forum – what is one thought you’d share with someone who has recently been diagnosed with IPF? DON’T GO IT ALONE!!!! Please reach out to family and friends. Stay connected even if it’s online. Research face-to-face groups on the Pulmonary Fibrosis Foundation website. Talk to a therapist, priest, rabbi, etc. This can be a dark, lonely and scary experience; a rollercoaster ride that’s terrifying and not fun. Remember that you are not alone!!! And there is a whole community of us just waiting with open arms. Share this post on Twitter and help spread the word for IPF. I have known Christine for years. She is such an inspiration! She is definitely not “alone” she has a very supportive family and host of friends that are cheering her on and praying for her complete healing. its truly an inspiration and thanks for sharing this blog! Thanks for sharing, I am on that roller coaster right now.Just doing all I can for myself, and hoping Esbriet can keep slowing it down started taking it on 4/11/2018. At PatientsLikeMe, people with every type of condition are coming together to share their health experiences, find patients like them and learn how to take control of their health. The result is improved care for patients as well as an acceleration of real-world medical research. Stay tuned to our blog for the latest happenings with our company, our patients and our mission of opening up the healthcare system. "Smart" gear for cold hands due to Raynaud's? Keto + other diet trends: Healthy or hype? See our members' online art show! Meet our 2019 Team of Advisors! Jim Dunham commented on Cannabidiol (CBD) oil and product FAQs: Fad or effective? Legal or not? Robin A JOHNSON commented on Have you experienced Lumiday side effects? © 2005–2019 PatientsLikeMe. All Rights Reserved. Information on PatientsLikeMe.com is reported by our members and is not medical advice.